The Hans Christian Award, The Fairy tale of My Life is a copper statuette in the shape of an eponymous book, Hans Christian Andersen’s autobiography. Sculptor Jens Galschiøt chose that book as his motive, both because, as an autobiography, the book’s subject is Hans Christian Andersen himself, and ­because the very title aptly epitomizes his life and person. ­A verse from Hans Christian Andersen’s poem Denmark, My ­Native Land is engraved on one of the pages of the open book. As an artist, Jens Galschiøt, who lives in Odense, has devot­ed much time to Hans Christian Andersen. He has created a number of major public works of art, among them exterior and interior decorations of the Odense Hans Christian ­Andersen Hotel. He is also known for his happenings all over the world, drawing attention to global problems of imbalance and ­to the humanitarian answers to these problems. 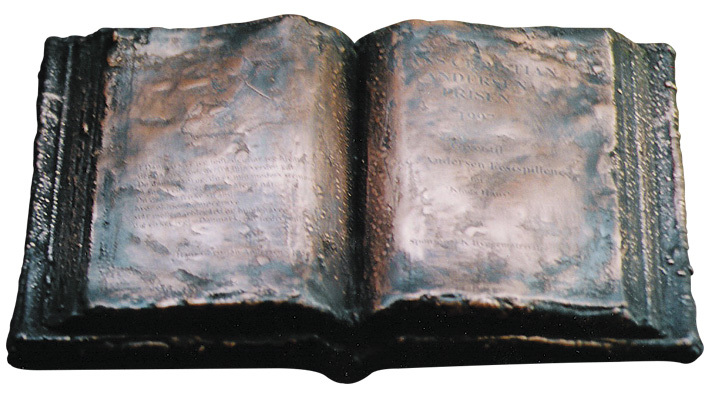 The copper statuette in the shape of an open book is created by Jens Galschiøt.